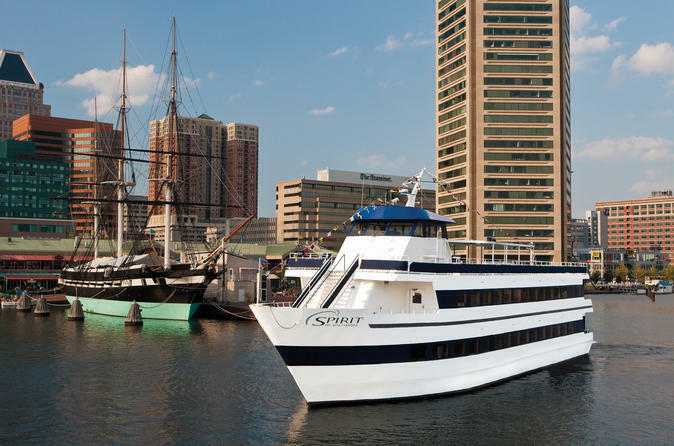 Grab the family, your group of friends, or colleagues and head out on the water for a Spirit of Baltimore lunch cruise. There is no better way to see the city than from aboard a cruise, perfect for sightseeing, lunch dates and more! Departing from the Inner Harbor and continuing along the Patapsco River, lunch cruises include two hours of incredible views of Baltimore’s historic waterfront. This lunch cruise on Baltimore's Inner Harbor is a fun and entertaining way to see some of the city's famous and historic landmarks. Enjoy the views from the deck of a sleek, sophisticated cruiser as the sun shines on downtown Baltimore. Beginning in the Inner Harbor and cruising along the Patapsco River, this cruise features 2 hours of incredible views of Baltimore’s historic and interesting waterfront attractions. See the Maryland Science Center, Federal Hill, Fort McHenry and the Francis Scott Key Bridge, among other sights along the route. Help yourself to tasty salads and entrees from the lunch buffet menu throughout the cruise and look forward to a sweet dessert assortment. Listen to music from our onboard DJ throughout the cruise and get out on the dance floor if the mood strikes. There’s never a dull moment aboard Spirit! The relaxed vibe and fun atmosphere makes this cruise the perfect afternoon break. See Itinerary section below for a sample dinner buffet menu.